High school teacher Barry Stewart has an interesting way of motivating his students to learn their way around the basics of construction. His biggest assignment is to build small dog and cat houses for pets and feral animals, which are then donated to organizations and families in need at no cost. Construction of these miniature houses is similar to the way large houses for humans are built. It presents similar challenges and prepares kids for possible careers in the industry, and it’s all for a good cause. 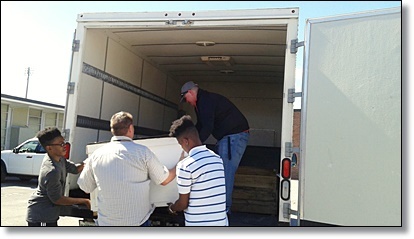 Mr. Stewart started this project in 2002 as a way to give his shop students at a career center some experience in the field of construction. 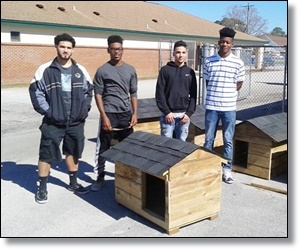 He had heard about Forsyth County Animal Control’s Houses for Hounds program–a program that works with animal welfare groups to give free dog houses to low-income residents. The project worked amazingly well as a teaching tool. Not only did students learn about construction, they innovated new ways to make animal houses more functional. For example, they moved doorways from the center of the house to the side to protect against wind, added two-inch entryways to prevent pets from removing their beds, and created removable roofs so feral cat caretakers could take kittens in for spaying and neutering before returning them to their families. 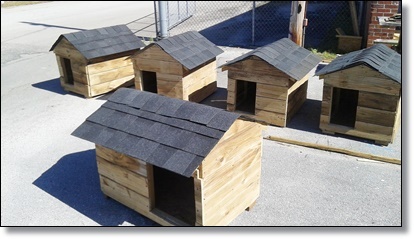 Stewart’s students have made over 600 dog houses and over 110 feral cat homes since he began assigning the project. Mr. Stewart now works in Jacksonville, Florida at Englewood High School and donates the pet houses made by students to organizations like Friends of Jacksonville Animals and Epic Animals Outreach. The students have also added feeding stations to their designs. The animal homes are often carried by animal welfare officers to warn people of the danger of leaving pets exposed to the elements. They are then provided to low-income families for free.